Cyclosporine is a selective immunosuppressant that has a variety of applications in medical practice. Like phenytoin and the calcium channel blockers, the drug is associated with gingival overgrowth. This review considers the pharmacokinetics, pharmacodynamics, and unwanted effects of cyclosporine, in particular the action of the drug on the gingival tissues. In addition, elucidates the current concepts in mechanisms of cyclosporine-induced gingival overgrowth. Clinical and cell culture studies suggest that the mechanism of gingival overgrowth is a result of the interaction between the drug and its metabolites with susceptible gingival fibroblasts. Plaque-induced gingival inflammation appears to enhance this interaction. However, understanding of the pathogenesis of gingival overgrowth is incomplete at best. Hence, it would be pertinent to identify and explore possible risk factors relating to both prevalence and severity of drug-induced gingival overgrowth. Newer molecular approaches are needed to clearly establish the pathogenesis of gingival overgrowth and to provide novel information for the design of future preventive and therapeutic modalities. The effect of CsA on proliferation of human gingival fibroblast (HGF) is still controversial ranging from absent to an increase or a decrease. However, these discrepancies in studies have been attributed to heterogeneity of the HGF strain used,  or to differences in the experimental conditions applied. Moreover, recent studies suggested that the accumulation of gingival fibroblasts observed in drug-associated gingival hyperplasia resulted from the inhibition of apoptosis. , Furthermore, recent attention has been drawn to the gingival keratinocytes as a potential part of the pathogenesis of CsA-associated gingival hyperplasia. The effect of CsA on gingival keratinocytes is still inconclusive ranging from being pro-proliferative, antiproliferative,  pro-apoptotic, antiapoptotic,  or no effect. However, all of these in vitro studies were conducted in monolayer cultures that lack the multilayer structure of the in vivo epithelium. It has been shown that the pathogenesis of CsA-induced gingival hyperplasia is associated with up-regulated level of salivary contents of proinflammatory cytokines including interleukin (IL) 1α, IL-8, and IL-6 compared to healthy controls. However, there have been no studies on release of these inflammatory cytokines in gingival keratinocytes following treatment with CsA. The clinical observations of the pathogenesis of CsA-induced gingival hyperplasia indicate a potential role for periodontal bacteria in the pathogenesis. However, most of these studies have been undertaken in vivo, and the findings are still inconclusive. It is not clear whether accumulation of dental plaque is a consequence of gingival changes caused by the drug itself, or it is an essential factor for initiating the pathogenesis. This difficulty in determining the exact role of gingival inflammation might be related to the complexity of the in vivo situation. Seymour and Smith reported that maintaining adequate oral hygiene in humans markedly reduced the severity of CsA-induced gingival hyperplasia, but it did not prevent the development of the condition. Recently, there has been evidence that CsA treatment can modulate the local expression of angiotensin II (Ang II) and up-regulation of angiotensin type 1 (AT1) receptors in gingival ﬁbroblasts and contribute to the role of renin angiotensin axis being stimulated by CsA contributing to the pathogenesis of drug-induced gingival overgrowth. However, understanding of the pathogenesis of gingival overgrowth is incomplete at best. Hence, it would be pertinent to identify and explore various possible pathogenesis of drug-induced gingival overgrowth for devising prevention and treatment strategies in susceptible patients. The present review analyzes the current concepts in pathogenesis of CsA-induced gingival overgrowth. 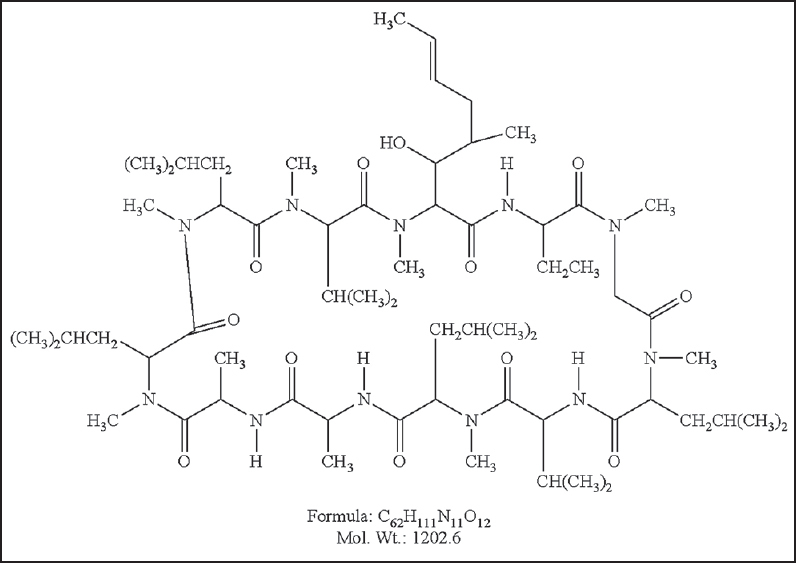 Cyclosporine A [Figure 1] is a neutral, hydrophobic cyclic peptide composed of 11 amino acids (mol. wt. 1202.6), all having the S-configuration of the L-amino acids, with the sole exception of the D-alanine in position 8, which has the R-configuration. CsA taken orally in a vehicle such as olive oil enters the circulation where it is distributed and bound to blood components. CsA rapidly equilibrates between plasma and red cells, with the establishment of a steady state within 20 min. Erythrocytes account for 50% of binding and lymphocytes 4-9%. Of the total amount of CsA in blood, about 5% is free drug, and 25% is bound to blood lipoproteins. Figure 1: Depicting molecular structure of cyclosporine A.
Cyclosporine is a selective immunosuppressant with a weak antimicrobial activity  and can be administered orally, intramuscularly or intravenously. The main use of cyclosporine is to prevent graft rejection in organ transplantation. Several studies have shown that cyclosporine selectively acts on the T-lymphocyte response, with little or no action on B lymphocytes. The pharmacodynamics of cyclosporine mainly involves the T-cell response. Hence, it is essential to know the role of T-lymphocytes in graft rejection. 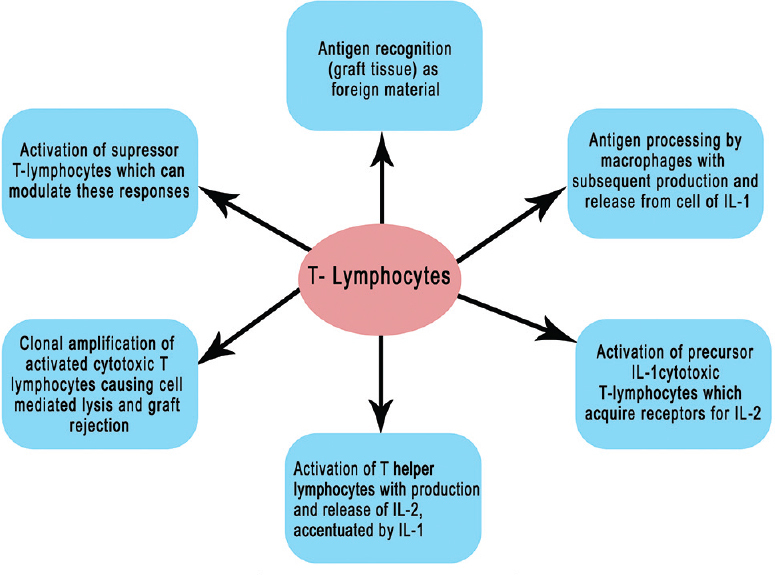 The mechanisms by which the T-lymphocytes reject the graft are shown in [Figure 2]. Figure 2: Role of cyclosporine in inhibition of graft rejection: Mechanisms by which the T-lymphocytes reject the graft. Cyclosporine inhibits many of the stages shown in [Figure 2], acting at both the cellular and molecular level. At low concentrations (10-20 ng/ml), it inhibits IL-2 synthesis, thereby limiting clonal amplification of cytotoxic T-lymphocytes. At a higher concentration (100 ng/ml), cyclosporine inhibits the ability of cytotoxic T-lymphocytes to respond to IL-2. The mechanism of this inhibition is uncertain but may be due to the drug blocking the induction of IL-2 receptors on these cells. By contrast, cyclosporine has a sparing effect on suppressor T-lymphocytes  to be resistant to cyclosporine, whereas cytotoxic T-lymphocytes and T-helper cells are sensitive to the drug. Within the T-lymphocyte, cyclosporine binds to several proteins, in particular calmodulin and cyclophilin. It has been postulated that the resistance or sensitivity of T-lymphocytes to cyclosporine may be related to the proportionate intracellular concentrations of calmodulin (involved in activation of T-lymphocytes) and cyclophilin. An increase in cyclophilin will increase cyclosporine binding, and thus prevent the drug from interacting with calmodulin. Conversely, low levels of cyclophilin will allow cyclosporine to bind to calmodulin and inhibit its formation and subsequent T-lymphocyte activation. The precise mechanism of cyclosporine-induced gingival overgrowth is uncertain. Various investigations for pathogenesis of gingival overgrowth support the hypothesis that it is multifactorial. A possible model is shown in [Figure 3]. , Cell culture studies have shown that both cyclosporine and cyclosporine metabolites have direct effects on gingival fibroblast proliferation, protein synthesis and collagen production. Furthermore, there exists a genetically determined subpopulation of cyclosporine sensitive gingival fibroblasts. Indeed, the terms "responders" and "nonresponders" have appeared in the literature to identify those who show or do not show drug-induced gingival changes. 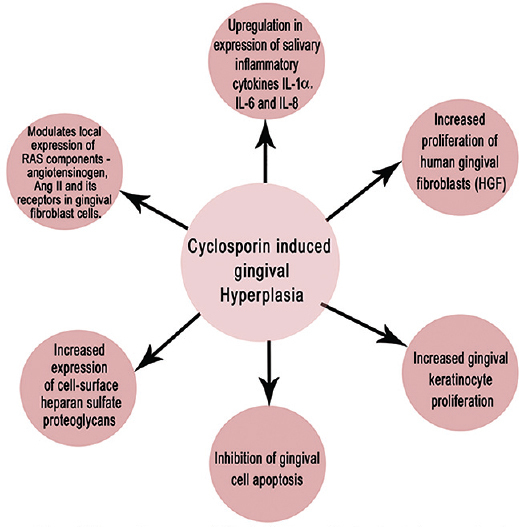 Both findings are important in the pathogenesis of cyclosporine-induced gingival overgrowth. Figure 3: Pathogenesis of cyclosporine A-induced gingival overgrowth: Model depicting the various mechanisms by which cyclosporine A causes gingival enlargement. Figure 4: Clinical presentation of cyclosporine A-induced gingival overgrowth. Some authors suggest that there is a significant relationship between amount of time without plaque control and development of gingival overgrowth,  whereas others believe there is no significant relation between cyclosporine-induced gingival overgrowth and plaque scores. It is well-known that the lipopolysaccharide is an important component of bacterial cell wall which is known to be cytotoxic for fibroblasts. There are various concepts highlighting the cause of gingival enlargement due to CsA. Cytokines and chemokines such as IL-1α, IL-1 β, IL-6, and IL-8 play a significant role in periodontal diseases  and growing attention has been paid to their potential role in the pathogenesis of CsA-induced gingival hyperplasia with conflicting results. It has been observed that incubation of normal and overgrown gingival fibroblasts for 24 h in or with different concentrations of CsA released no detectable amount of IL-1β compared to control, whereas production of IL-6 in all fibroblast strains was suppressed in a dose-dependent manner with the maximal inhibition being reported at 2000 ng/ml CsA. This was in contrast to a recent observation which demonstrated that 500 ng/ml CsA up-regulated production of IL-6 and transforming growth factor (TGF) β1 in HGFs in a time-dependent manner with the maximal release being reported at 24 h.  But, it has been observed that neutralization of TGF-β1 resulted in a significant reduction in expression of CsA-induced IL-6 while release of CsA-induced TGF-β1 was not affected by blocking IL-6. These findings suggest that TGF-β1 is an essential regulator of CsA-induced IL-6 release in HGFs. In addition, it has been reported that HGFs treated with IL-6 or TGF-β1 exhibited an increased rate of proliferation compared to control. Furthermore, neutralizing IL-6 and TGF-β1 caused down-regulation of CsA-induced HGF proliferation rate. The effect of CsA on IL-1α and IL-8 has received little direct attention, although it has been suggested that the pathogenesis of CsA-induced gingival hyperplasia may involve alteration in the expression levels of various inflammatory cytokines in the gingiva. It has been observed that an increase in the salivary levels of IL-1α, IL-6, and IL-8 in patients with CsA-induced gingival hyperplasia occurs. , Up-regulation of these cytokines thus have a direct effect in causing gingival hyperplasia. Long-term exposure to CsA may have a stimulatory effect on gingival fibroblast proliferation. Bartold  observed that 10-9 g/ml CsA up-regulated DNA synthesis and the proliferation rate of HGF with most noticeable stimulation being reported in the presence of 10% fetal bovine serum (FBS), and that this capacity was retained even in absence of FBS or in the presence of lipopolysaccharide that usually inhibit proliferation of these cells. In the agreement with Bartold's findings, Chae et al. also showed that treatment of serum starved HGFs with CsA (100 and 500 ng/ml) for 6 days significantly activated the cell cycle along with an increase in the cell viability and DNA incorporation. These findings were also in agreement with a flow cytometric study that showed an increase in the in vitro proliferative activity of CsA-treated HGF illustrated by a promoted progression of cell cycle and an increase in the expression level of cyclin B1. It was recently observed that CsA up-regulated cell viability in HGF cell lines with a maximal increase being found in HGF cells obtained from CsA-induced overgrown gingival tissues. Interestingly, a bimodal effect of CsA on proliferation of HGFs has been observed when cultured for 24 h; low doses of CsA (≤200 ng/ml) stimulated HGF proliferation, whilst higher doses of CsA (400-800 ng/ml) inhibited proliferation of these cells. In contrast to the previous findings, it was observed that long-term exposure to a low dose of CsA (200 ng/ml) had no effect on viability and proliferation of HGFs. While extremely high doses of CsA (5-10 g/ml) induced a significant decrease in HGF proliferation. Furthermore, in vitro 24 h stimulation with CsA failed to induce an increase in HGF proliferation. However, these discrepancies between studies could be attributed to heterogeneity of cell line strains or to differences in the experimental conditions. The renin angiotensin system (RAS) is considered as a hormonal circulatory system involved in maintaining blood pressure, electrolyte, and ﬂuid homeostasis. RAS components can be synthesized in local tissues and are found to play a role in gingival overgrowth. Recently, its role has been implicated in causing drug-induced gingival overgrowth. The expression of Ang II and its receptors was observed in gingival ﬁbroblast cells treated with cyclosporine. Ang II mRNA and protein expression was signiﬁcantly higher in patients with drug-induced gingival enlargement than in patients with periodontitis and healthy subjects. The angiotensin II receptor type I (AT1) mRNA was expressed more than AT2 in all examined tissues. In gingival ﬁbroblasts, Ang II and AT1 expressions were increased with cyclosporine incorporation compared to controls. It was thus suggested that cyclosporine can modulate local expression of RAS components such as the angiotensinogen, Ang II, and its receptors in gingival tissues and gingival ﬁbroblast cells. Gingival overgrowth is a side effect of the long-term administration of cyclosporine and may also be influenced by other predisposing factors, like bacterial plaque. It needs to be emphasized that elimination of local factors followed by thorough maintenance has a definitive significant inhibitory effect on gingival overgrowth. Surgical treatment to excise and remodel the gingival contour should be considered whenever gingival overgrowth causes esthetic and functional problems. Understanding the various mechanisms, underlying the pathogenesis of cyclosporine-induced gingival overgrowth, will help the clinician devise better prevention strategies in patients susceptible to gingival overgrowth. Hence, it would be pertinent to identify and explore possible risk factors relating to both prevalence and severity of drug-induced gingival overgrowth. Newer molecular approaches are needed to clearly establish the pathogenesis of gingival overgrowth and to provide novel information for the design of future preventive and therapeutic modalities. We would like to thank SRM Dental College, Ramapuram, Chennai and SRM University for supporting this work. Borel JF. The history of cyclosporine-A and its significance. In: White DJ, editor. Cyclosporin A: Proceedings of an International Conference on Cyclosporine A. 3 rd ed. Cambridge: Elsevier; 1982. p. 5-17. Condé SA, Aarestrup FM, Vieira BJ, Bastos MG. Roxithromycin reduces cyclosporine-induced gingival hyperplasia in renal transplant patients. Transplant Proc 2008;40:1435-8. Faulds D, Goa KL, Benfield P. Cyclosporin. A review of its pharmacodynamic and pharmacokinetic properties, and therapeutic use in immunoregulatory disorders. Drugs 1993;45:953-1040. Chang SH, Lim CS, Low TS, Chong HT, Tan SY. Cyclosporine-associated encephalopathy: A case report and literature review. Transplant Proc 2001;33:3700-1. Galán AI, Fernández E, Morán D, Muñoz ME, Jiménez R. Cyclosporine A hepatotoxicity: Effect of prolonged treatment with cyclosporine on biliary lipid secretion in the rat. Clin Exp Pharmacol Physiol 1995;22:260-5. Woolfson RG, Neild GH. Cyclosporin nephrotoxicity following cardiac transplantation. Nephrol Dial Transplant 1997;12:2054-6. Textor SC, Canzanello VJ, Taler SJ, Wilson DJ, Schwartz LL, Augustine JE, et al. Cyclosporine-induced hypertension after transplantation. Mayo Clin Proc 1994;69:1182-93. Seymour RA, Ellis JS, Thomason JM. Risk factors for drug-induced gingival overgrowth. J Clin Periodontol 2000;27:217-23. Seymour RA, Jacobs DJ. Cyclosporin and the gingival tissues. J Clin Periodontol 1992;19:1-11. Kataoka M, Kido J, Shinohara Y, Nagata T. Drug-induced gingival overgrowth - A review. Biol Pharm Bull 2005;28: 1817-21. Marshall RI, Bartold PM. A clinical review of drug-induced gingival overgrowths. Aust Dent J 1999;44:219-32. Guo J, Wang W, Yao L, Yan F. Local inflammation exacerbates cyclosporine A-induced gingival overgrowth in rats. Inflammation 2008;31:399-407. Bartoli F, Castronovo G, Stabile A. Risk factors conditioning the incidence and severity of cyclosporine A-induced gingival overgrowth and methods of prevention. Minerva Stomatol 2004;53:165-70. Kantarci A, Augustin P, Firatli E, Sheff MC, Hasturk H, Graves DT, et al. Apoptosis in gingival overgrowth tissues. J Dent Res 2007;86:888-92. Bartold PM. Regulation of human gingival fibroblast growth and synthetic activity by cyclosporine - A in vitro. J Periodontal Res 1989;24:314-21. Hassell TM, Stanek EJ 3 rd . Evidence that healthy human gingiva contains functionally heterogeneous fibroblast subpopulations. Arch Oral Biol 1983;28:617-25. Leonardi A, DeFranchis G, Fregona IA, Violato D, Plebani M, Secchi AG. Effects of cyclosporin A on human conjunctival fibroblasts. Arch Ophthalmol 2001;119:1512-7. Jung JY, Jeong YJ, Jeong TS, Chung HJ, Kim WJ. Inhibition of apoptotic signals in overgrowth of human gingival fibroblasts by cyclosporin A treatment. Arch Oral Biol 2008;53:1042-9. Tu HP, Fu E, Chen YT, Wu MH, Cheng LC, Yang SF. Expression of p21 and p53 in rat gingival and human oral epithelial cells after cyclosporine A treatment. J Periodontal Res 2008;43:32-9. Tu HP, Chen YT, Chiu HC, Chin YT, Huang SM, Cheng LC, et al. Cyclosporine A enhances apoptosis in gingival keratinocytes of rats and in OECM1 cells via the mitochondrial pathway. J Periodontal Res 2009;44:767-75. Ruhl S, Hamberger S, Betz R, Sukkar T, Schmalz G, Seymour RA, et al. Salivary proteins and cytokines in drug-induced gingival overgrowth. J Dent Res 2004;83:322-6. Seymour RA, Smith DG. The effect of a plaque control programme on the incidence and severity of cyclosporin-induced gingival changes. J Clin Periodontol 1991;18:107-10. Subramani T, Senthilkumar K, Periasamy S, Rao S. Expression of angiotensin II and its receptors in cyclosporine-induced gingival overgrowth. J Periodontal Res 2013;48:386-91. Borel JF, Feurer C, Gubler HU, Stähelin H. Biological effects of cyclosporin A: A new antilymphocytic agent. Agents Actions 1976;6:468-75. Beveridge T, Gratwohl A, Michot F. Cyclosporine A: Pharmacokinetics after a single dose in man and serum levels after multiple dosing in recipients of allogenic bone marrow grafts. Curr Ther Res 1981;30:5-10. Britton S, Palacios R. Cyclosporin A - Usefulness, risks and mechanism of action. Immunol Rev 1982;65:5-22. Hegde R, Kale R, Jain S. Cyclosporine and amlodipine induced severe gingival overgrowth-etiopathogenesis and management of a case with electrocautery and carbon-dioxide(CO2) laser. J Oral Health Commun Dent 2012;6:34-42. Seymour RA, Thomason JM, Ellis JS. The pathogenesis of drug-induced gingival overgrowth. J Clin Periodontol 1996;23:165-75. Friskopp J, Klintmalm G. Gingival enlargement. A comparison between cyclosporine and azathioprine treated renal allograft recipients. Swed Dent J 1986;10:85-92. Hall EE. 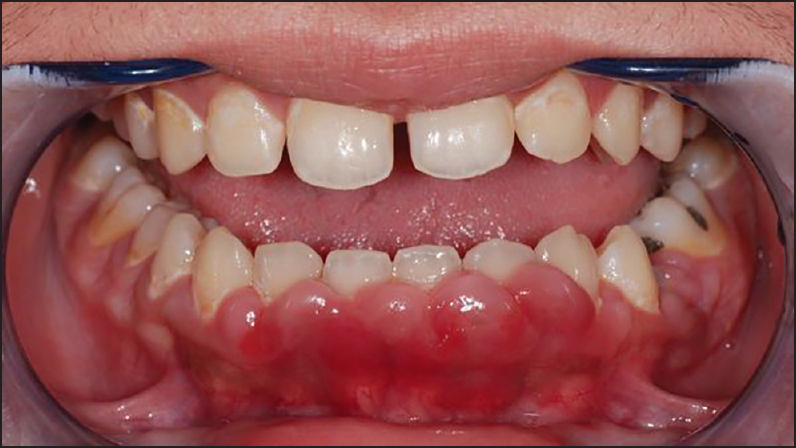 Prevention and treatment considerations in patients with drug-induced gingival enlargement. Curr Opin Periodontol 1997;4:59-63. Grover V, Kapoor A, Marya CM. Amlodipine induced gingival hyperplasia. J Oral Health Commun Dent 2007;1:19-22. 32.Tyldesley WR, Rotter E. Gingival hyperplasia induced by cyclosporin-A. Br Dent J 1984;157:305-9. Okada H, Murakami S. Cytokine expression in periodontal health and disease. Crit Rev Oral Biol Med 1998;9:248-66. Myrillas TT, Linden GJ, Marley JJ, Irwin CR. Cyclosporin A regulates interleukin-1beta and interleukin-6 expression in gingiva: Implications for gingival overgrowth. J Periodontol 1999;70:294-300. Chae HJ, Ha MS, Yun DH, Pae HO, Chung HT, Chae SW, et al. Mechanism of cyclosporine-induced overgrowth in gingiva. J Dent Res 2006;85:515-9. Cotrim P, Martelli-Junior H, Graner E, Sauk JJ, Coletta RD. Cyclosporin A induces proliferation in human gingival fibroblasts via induction of transforming growth factor-beta1. J Periodontol 2003;74:1625-33. Parkar MH, Hussain F, Wickramaratna A, Olsen I. The immunosuppressant and hyperplasia-inducing drug cyclosporin A regulates the cell cycle and cyclin B1 gene expression in gingival fibroblasts in vitro. Cell Tissue Res 2004;317: 221-5. Kim JY, Park SH, Cho KS, Kim HJ, Lee CK, Park KK, et al. Mechanism of azithromycin treatment on gingival overgrowth. J Dent Res 2008;87:1075-9. 39.Yamaguchi M, Naruishi K, Yamada-Naruishi H, Omori K, Nishimura F, Takashiba S. Long-term cyclosporin A exposure suppresses cathepsin-B and-L activity in gingival fibroblasts. J Periodontal Res 2004;39:320-6. Hyland PL, McKeown ST, Mackenzie IC, Irwin CR. Regulation of keratinocyte growth factor and scatter factor in cyclosporin-induced gingival overgrowth. J Oral Pathol Med 2004;33:391-7. Yoshida T, Nagata J, Yamane A. Growth factors and proliferation of cultured rat gingival cells in response to cyclosporin A. J Periodontal Res 2005;40:11-9. Gnoatto N, Lotufo RF, Matsuda M, Penna V, Marquezini MV. Expression of cell-surface heparan sulfate proteoglycans in human cyclosporin-induced gingival overgrowth. J Periodontal Res 2007;42:553-8. Fulda S, Debatin KM. Extrinsic versus intrinsic apoptosis pathways in anticancer chemotherapy. Oncogene 2006;25: 4798-811. Barbara AT. Management of drug-induced gingival enlargement. Aust Prescrire 2003;26:11-3.